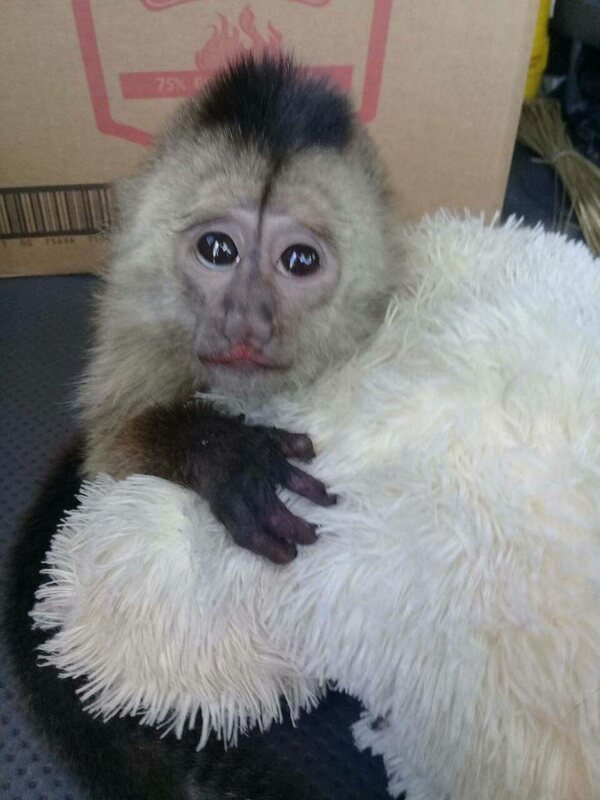 SAVED: The capuchin monkey which was rescued by game wardens and police on Friday last. A FOUR-month-old baby capuchin monkey, which was found wrapped in a piece of clothing inside a car, was yesterday taken before a Siparia magistrate as an exhibit in a case. The monkey, a protected animal under the Conservation of Wildlife Act, was expected to be sold by a Point Fortin man last Friday morning. The monkey was rescued when a team of game wardens and police intercepted a car at Erin Road, Santa Flora. Police arrested 27-year-old Akiem John, a disc jockey of Warden Road. He appeared yesterday before senior magistrate Margaret Alert. He pleaded guilty to the charge of having the money without a permit. He was charged by senior game warden Andy Singh. John told the magistrate that he had plans to sell the monkey. In reprimanding and discharging John, Alert said she took into consideration that he was a first-time offender. She ordered that the monkey be taken to the Conservator of Forests for rehabilitation. Reply to "Baby monkey in court"